Northwest Exteriors patio and deck covers are strong and durable, virtually maintenance free, never need painting, and can withstand winds over 110 miles per hour! The broad categories of patio cover designs include open, roofed and enclosed (also referred to as sunrooms). Trust your home to Northwest Exteriors, and transform your patio from ordinary into an extraordinary luxurious retreat. Northwest Exteriors combine energy efficiency and flexible design to create a truly superior custom patio cover specifically designed for your family needs and lifestyle. Let the professional design team from Northwest create the perfect patio cover for your and your home. 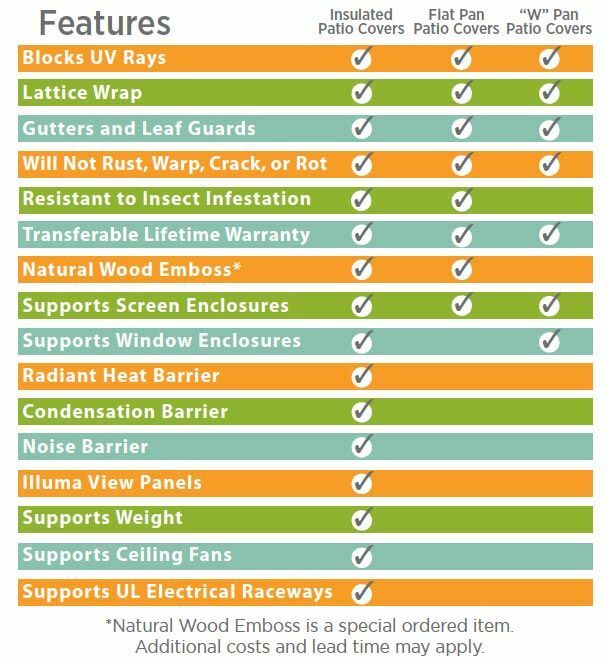 To help you decide on the best patio cover for your home, have a look at the handy comparison chart provided by our friends over at Four Seasons Building Products. As you can see, the chart indicates the differences between the various patio covers now available. It would seem obvious, the insulated patio covers offer the most, however depending on your needs, you may or may not need everything offered. No matter what, you’ll want to choose products that block UV rays, provide gutters, and will not rust, warp, crack or rot! Also, in order to make an informed decision you’ll need to know costs and speak with one of our experts. When it comes to home improvements, there’s no one size fits all pricing. Our Northwest Exteriors project manages will help provide you with the ALL the information and details necessary to decide on the perfect patio cover for your home and budget. Please complete the form above and one of our team members will contact you to arrange for a visit. Where state-of the-art technology meets total comfort. Unique. Innovative. Sophisticated. These words do not even begin to describe the LifeRoom experience. LifeRoom is so technologically advanced, it makes every room before it look primitive. Imagine… remote control screens, soothing mood lighting, and soft breeze technology. There’s even a cool mist climate system that can reduce the room temperature up to 40° F. LifeRoom is the perfect addition to your home… and your life. Created to give you an oasis from the stress of everyday living, LifeRoom lets you escape to a world of tranquility and comfort, to entertain, watch tv, or just relax. LifeRoom’s state-of-the-art technology makes it a room for today and tomorrow…at a price that’s extremely comfortable for your budget, too. Four Seasons pergolas can add a whole new architectural element to your garden as an inviting gateway, an open cover for your patio or deck or an attractive structure upon which beautiful flowering vines can be trained to grow and provide an ever-changing focal point to your outdoor landscape. A Four Seasons Patio Cover provides elegant protection from the blazing sun and light rains so you can enjoy your patio when others are driven inside. Corradi products are easy to love with superior standards for construction and design that withstand as well as compliment the test of time and elements. From our Exterior Motorized Screens and Art of Shading line to our exclusive Pergotenda® collection, Corradi USA offers a variety of ways to control and harmonize your outdoor space, bringing your outdoor dreams to life. Privately owned and operated since 1995, Polar Shades, INC is an industry leader for providing the ultimate in interior or exterior sun control products with a 21,000 square foot “state of the art manufacturing facility”, located in Henderson, NV. The quality and service of our products is unmatched in the industry, we are raising the bar in quality all over the country. We are now supplying over 1000 independent dealers nationwide with our shade products for residential, commercial, health care and hospitality projects. 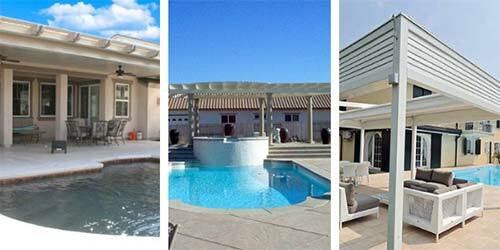 ShadeTree® Retractable Canopy Systems turn your hot deck or patio into a cool, shaded "outdoor room". Attractive and flexible retractable shade for your deck or patio that also adds value and hours of enjoyment to your home. Modular retractable canopies cover small odd-shaped, or LARGE areas - spans up to 24'! Helps reduce air conditioning costs!